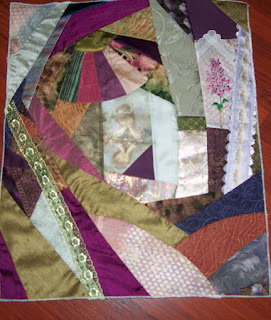 Several weeks ago joined a new round robin with my friends Susan, Moira and Fran, and pieced my block for this. This will be called Fairies in my Garden and am will be framed as a picture for my daughter Kristen, who loves fairies. Decided to have a blog devoted to crazy quilting, and hope to keep up with it, at least posting the progress on the round robin. I also need to piece a promised CQ vest for Kyleigh with sea life. It was funny but before Christmas Kyleigh and I were looking through the "fishie fabric" for her vest and she asked if I would make her teacher, Mrs. Stenkylft a dolphin quilt first. I got that pieced and it is ready to quilt. As soon as I get it quilted will post that too. Their first grade class is called "The Dolphins". So across the top of the quilt I lettered Mrs Stenkylft's Dolphins.